as for my previous show up until the last ones i spoke to you about was basically ascot – which was our last 90cm show. double clear & a clear. after that it was the derby. we entered the open working hunter class: clear in the jumping, got good marks with the conformation – although ride by judge didnt go as well as i’d hoped. i must admit i was a lil intimidated by riding with some of the big names in the same class – haha. it went super well overall & sue goodman (one of the judges) came & spoke to me after the class with some very positive encouragement. she said id had missed a placing by a fraction of a margin. not that i had set out with a placing in mind. fairy was just so amazing! she did everything from the bank to the dyke, steps water everything the bob charter had to throw at us. 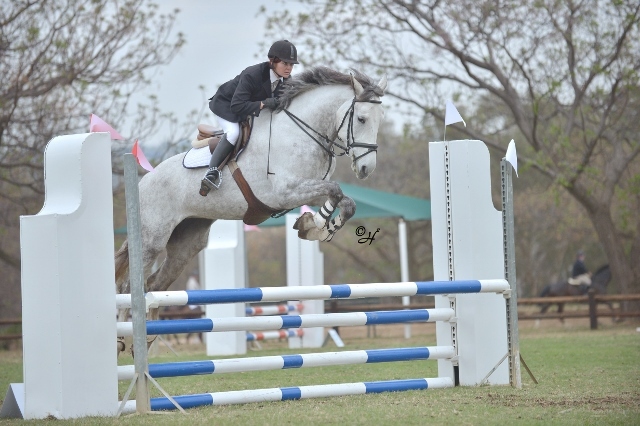 we had our first 1metre showjumping at burlington, the following weekend. pulled a pole in the competition round, but went clear in the speed round. after that i did the sundlands novice challenge – where we got a 60% & 62.something for both our novice tests – smiles all round there;-)) i finished off my october campaigning with the 90cm eventing at fourways. we lay 3rd after the dressage & 1st after the country. she went like a demon. my horse just keeps getting better & better with time – like a good wine;-) unfortunately i do think the day got a bit long for both of us & we had three poles down in the showjumping – which took quite a toll. just before i moved down here, i attended the tim lips clinic. how awesome was that?! he is an amazing horseman & a brilliant instructor. had loads of fun & both of us learnt stacks. Fairy at Ascot – what a jump!